Smithii will do if that is all that's available. Lavender or Lavandin: for pain relief, relaxation, and antibacterial properties. Sweet Basil: for mental clarity, to prevent "brain fog", as well as a decongestant. very careful NOT to get any in your eyes! Lavender will relieve this symptom of stress. German), Clary Sage, Jasmine, Rosemary, and Melissa. best known as an anti-viral, but many sources say it is helpful for migraine relief. seems to stop a lot of migraines in their tracks. abdomen can help prevent hormone related migraines. that often accompanies a severe headache. people who just love use of these healing products. 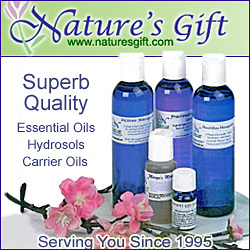 oils and other products from all over the world and make them available for people who expect the best. what we do: "Every day, all over the world, you send out boxes full of joy and healing." We are among the blessed few who get to do what we love! All views expressed in the articles on our site are those of the various authors, they are presented here for your enjoyment and enlightenment. These views do not necessarily represent the views of SharAmbrosia or the "all natural health" website. Copyright 2009 ©SharAmbrosia. All rights reserved.